Guest Post by Marie-Therese Gramstadt, KULTIVATE Project Manager, VADS. 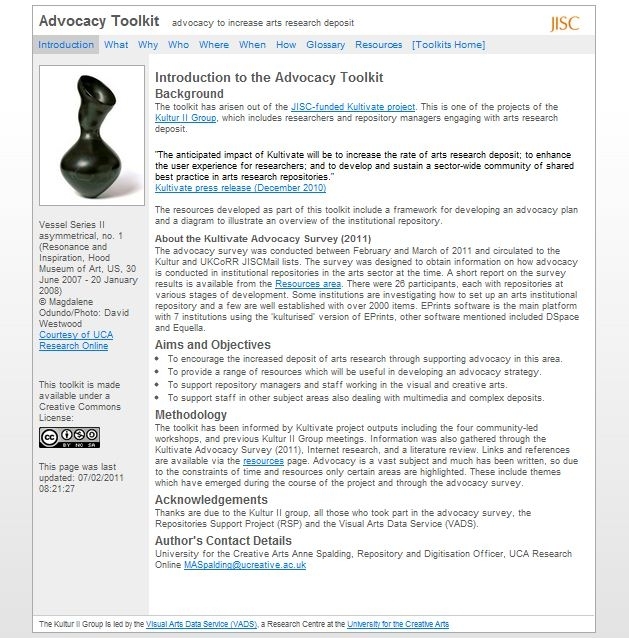 Funded through the JISC Information Environment programme 2009-11, the Kultivate project makes available two new toolkits for the UK Higher Education community: an advocacy for arts research toolkit aimed at repository managers; and a decision-making toolkit for artistic researchers. The Kultivate project has arisen out of the Kultur II Group, which consists of researchers and repository staff engaging with arts research deposit in institutional research repositories, and is led by the Visual Arts Data Service (VADS), a Research Centre of the University for the Creative Arts. This toolkit is aimed at repository managers and staff involved in promoting their institutional research repositories. It aims to support staff in planning and developing their advocacy approach in order to increase arts research deposit. The Resources page provides access to all the materials generated as part of the toolkit including a visual diagram and example strategy plan, which can be re-purposed by individual institutions to their needs. 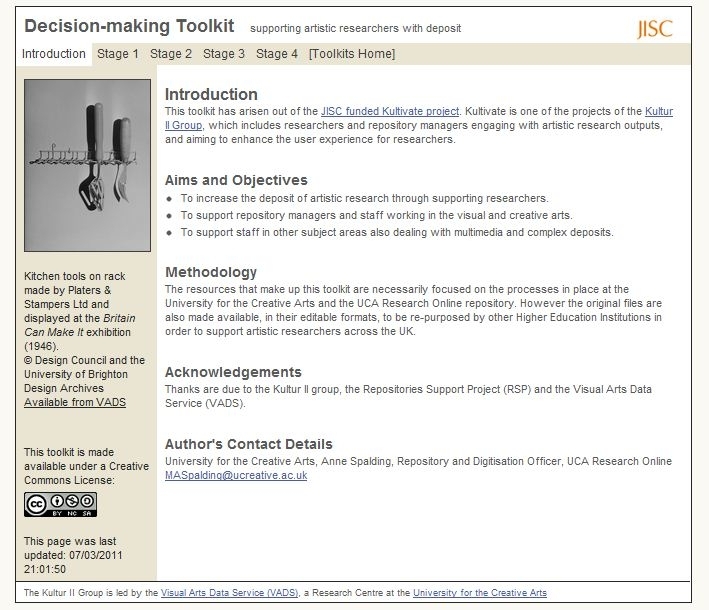 This toolkit has been designed for artistic researchers in UK Higher Education. However as it describes processes and workflows these aspects have been taken from the current procedures in place at UCA Research Online, University for the Creative Arts, where the author is based. The CC License does not apply to the images, which each have their own rights statements. The images have been provided by research repositories from the University for the Creative Arts, University of the Arts London, and University of the West of England; in addition images have been sourced from VADS. Thanks are due to the Kultur II Group, all those who took part in the Kultivate Advocacy survey (2011), and the Repositories Support Project (RSP). I am based at the Centre for Research Communications at the University of Nottingham. I work on the JISC funded Repositories Support Project which supports the development and growth of the UK repositories network.